Who is the Cat Exercise Wheel Not Suited For? ​What ​Did People on Social Media Think? Being a Bengal cat lover, I know, just as you too probably know, the health and happiness of our Bengal cats is very important. Sometimes, however, as pet parents we can get really involved in our busy lives that we might forget that our Bengal cats need the kind of exercise that is going to keep them in shape and in a good mood, much like us. There are many things one can do to offer them such as an exercise wheel, interactive toys and so on. I realized that I couldn’t let my Bengal just go outside any time, especially when I wasn’t home and that eventually turned into a problem for my feline friend. Like most of you reading this, I have a full-time job and am not always able to be home with my Bengal cat and take her outside. Because of this, I'd usually get home after a long day of work to a Bengal full of energy that was ​frantically begging me to play with her. In addition, there was also weight gain because she hasn't been able to exercise appropriately. This weight gain started to make me feel guilty because, after all, it was my responsibility to keep my Bengal healthy and happy. In an effort to do so, I purchased the FerrisCatWheel from ZiggyDoo​. It was a little pricey, ​but much less than other more expensive wheels that can run you over $1000+ USD. Like people, Bengals and all pets need to be kept at a healthy weight or there could be a variety of health issues that could pop up. These health issues can be severe enough to even shorten their lives and you know we don’t want to see that happen to our Bengals. Diabetes – This is one of the most common problems your Bengal can run into if they are overweight. Overweight or obese cats are two to four times more likely to develop diabetes. This is because obesity can cause an increase in the production of insulin in response to the increased blood sugar levels that are found in cats that are overweight. Insulin is also more in demand because there is a greater amount of tissue in a cat that's overweight. Liver Disease – The liver is an organ that stores fat when a Bengal is overweight. When they are overweight, the fat builds up in their livers. This is most commonly known as hepatic lipidosis and is extremely common in obese cats. Arthritis and Lameness – If they are overweight they are more likely to develop arthritis and lameness than cats who are at their ideal weight. This can cause them a lot of pain and injury when they try to jump up and down from furniture and other places that are up high. Increased Anesthetic and Surgical Risks – Vets often have to take extra precautions when it comes to anesthetizing obese cats or performing surgery on them. A lot of anesthetics are taken up by the fat in their bodies. Also the anesthetics are broken down by their liver and if a cat has a “fatty liver” it might not be able to efficiently break down the anesthetics or other drugs. Recovery from surgery may take longer in an obese cat. On top of all of this, it might make surgery a lot more difficult when a cat is obese. It can be a lot more difficult to find or get to what the vet is looking for by obscuring the surgical area. Lower Quality and Length of Life – When cats are overweight it makes it more difficult for them to groom themselves and to be active. They can even become irritable because being overweight can make them uncomfortable and even be painful. Of course being overweight can also shorten the length of their lives, something none of us want to see that happen. Bad Behavior - This can typically be brought on by boredom and an overly lethargic lifestyle. The first and immediate thing that I decided to do was to change my Bengal’s diet in hope that this would solve the problem of the extra pounds. There are a lot of different foods out there and I had to do a lot of research on the best cat food for my overweight Bengal. Even though a change of diet was a good idea and did help some, it became apparent that more than a change of diet was going to be needed to help my Bengal shed those unhealthy pounds and burn all the excess energy that she had. That’s when someone mentioned to me about considering getting a cat exercise wheel. This was not something that I had even thought of before nor did I realize that there was such a thing for cats. Age, health and weight are factors to consider when thinking of getting your cat an exercise wheel. Not all cats, including Bengals may be suited for a cat exercise wheel. ​For example, a cat exercise wheel may also not be well suited for some elderly cats or ones that may have joint problems. If you have any doubts, always ask the vet first. 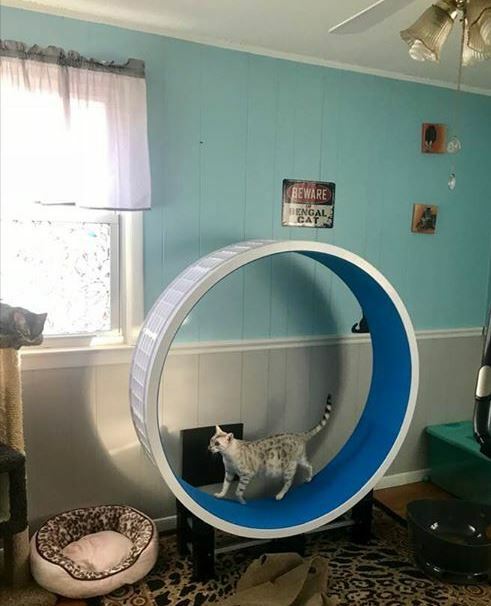 ​Almost all cats have the potential to enjoy using a cat exercise wheel. Since Bengals are so active and intelligent, they are more easily trained to use the wheel. If you’re lucky like I was, you may not have to train your Bengal at all. Some will need a modest bit of play to get going. And some may need more teaching from you over several days to help them feel comfortable and confident on the wheel. (ZiggyDoo provides great after service for any help or tips you may need for your cat). It needs to​ ​be large enough in size so that it protects the cat’s back. This means it should be at least 48” in diameter. When I was searching for cat exercise wheels, there are ​a handful of options but I noticed that many of them were extremely expensive. ​I found four of them that cost over $1000 and to be honest, that just wasn't in my budget. So, I continued to shop. When looking for ​​wheels under $500 USD, there were two options that came up on my radar. ​In terms of the cost, the OneFastCat wheel costs about $200 while the FerrisCatWheel from ZiggyDoo ​costs ​just under $400. ​Any cat wheel is an investment, and wheels will be more pricey than typical cat toys, but I decided I was committed to giving my Bengal cat the exercise she needed, and the wheel was the best solution. So, I figured it would be worth comparing the two. To ​compare the two wheels, I joined the BengalCatClub Facebook group to see what people had to say. I figured I'd just let the consensus speak to unders​tand if the FerrisCatWheel from ZiggyDoo​ was worth the extra money in comparison to OneFastCat. ​Here's what people said, direct screenshots from the Facebook group. I removed the names of the people so that they can have their anonymity. At first, OneFastCat seemed like a good idea. From what I saw, there were a few people who bought it and I figured to save an extra $200, sure. ​I love my Bengal and an extra $200 for her safety of her is well worth it to me. That being said, moving forward here I am only going to talk about the FerrisCatWheel from ZiggyDoo ​as that is what I choose to get. 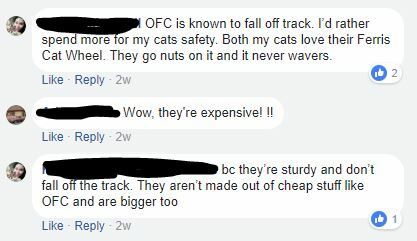 Here's what people were saying about the Ferris Cat Wheel in the Facebook group. Easy to put together - ​comes with everything you need and also has easy-to-follow YouTube videos prepared by ZiggyDoo. ​Latest model G5 is really easy to put together – the white wheel pieces slide into position ( no hammering mallet is needed) and then reinforced with bolts which makes the wheel strong and sturdy. ​Sleek modern design ​that's lightweight which makes it easy to move wherever you want and it looks great. Here’s a picture of the Ferris Cat Wheel from ZiggyDoo​. ​Has a deluxe wheelbase which includes 6 skate wheels for additional support in the center of the wheelbase. ​Brings so much enrichment and stimulation to the lives of indoor cats. wheelbase includes additional support in the center of the wheelbase. With 6 skatewheels, the wheel is even more sturdy than ever to provide maximum possible support for strong runners and heavier cats! Walk Your Bengal – If you have the time, you can always train your Bengal to a harness and leash so the two of you can both go outside together and enjoy a good walk. This is probably the least expensive way to give your Bengal their needed exercise. The benefits you'll reap from this exercise is that not only will both of you lose weight but you'll enjoy a closer bond with your Bengal. Cat Trees – Providing your Bengal with a good ​cat tree will give your Bengal a variety of options such as clawing, climbing, and jumping. All of which provide them with ways to get rid of excess weight and energy. Interactive Toys – There are a ​large variety of toys you can buy for your Bengal that require them to interact. There are toys that have moving parts that will get them up and moving. Cat teaser toys also work well to get your cat active. Even balls that have catnip or bells in there are a way to get your Bengal up and exercising. It's important to remember that the health of your Bengal is very important if you want them to live a long and happy life. Understand that if you allow your Bengal to become overweight and you don't do anything to reverse it your Bengal could end up with diabetes, joint problems, arthritis, live problems, and more. A ​cat exercise wheel could be something that could help you avoid or even solve these problems. If you want to learn more about this cat exercise wheel and you want to ​see more info feel free to Click Here. Shipping is usually free – depending on where you live.